SpongeBob You're Fired (Episode) – From SpongePedia, the biggest SpongeBob-wiki in the world! SpongeBob You're Fired is an episode from Season 9. To save money, Mr. Krabs fires SpongeBob. He goes back home depressed, and makes homemade snail food for Gary. Patrick and Sandy have a taste tester. It is revealed Patrick has allergies and grows an a additional head. He tries out Weenie Hut, but all he makes is Weenie Patties. He got fired again, but goes to the Pie Hole, where he makes Pizza Patties. He makes different Jobs like Burrito Patties at the Taco Sombrero, and Noodle Patties at the Wet Noodle, but was fired five times a day. He gets taken by the Weenie Hut, so is the other mascots. A giant krabby patty rescues SpongeBob, and is rehired. It is a burnt mess, so he does his work. It's shown that Squidward was the krabby patty the whole time. This episode first premiered in Greece on July 3, 2013. 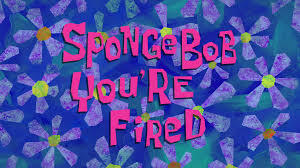 This is one of the few times Mr. Krabs fired SpongeBob. The stores SpongeBob worked at but got fired from were: Weenie Hut, Pie Hole, Taco Sombrero, Wet Noodle, and a taste tester at Sandy's Treedome. In production order, this is the last episode produced before the production of the The SpongeBob Movie: Sponge Out of Water, and before Stephen Hillenburg returned to work on SpongeBob. This page was last modified on 9 March 2018, at 22:43.